There was about 6 inches of rain up in Lake Arrowhead. There would have been extra water in Deep Creek because the Arrowhead Lake Association forgot to open the gates to allow the water to go into Lake Arrowhead so the extra rainwater headed down to Deep Creek. I know this is late and you either went or you didn't. But sometimes the water level can be caused by actions or nonactions taken up above. I have heard about huge unexpected floods occurring in the past. 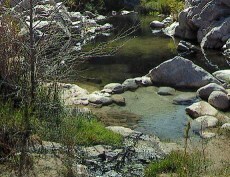 In December 2010, the Lake Arrowhead Community Services District up here had a huge sewage spill where millions of gallons of raw sewage were unleashed to the creeks below and eventually to the Mojave River.